NOTE: C.A.L.L. HAS FINISHED. But the fact behind has not changed. When you log in to Second Life you hand what you made over to Linden Lab. Their prims, their property. Their surface to rez, their texture. This was the posting in September 2013, that made some creators think about taking part in VULCANICUS. 63 artists in total until now. We are happy that the time capusule is full, also with some world famous works. 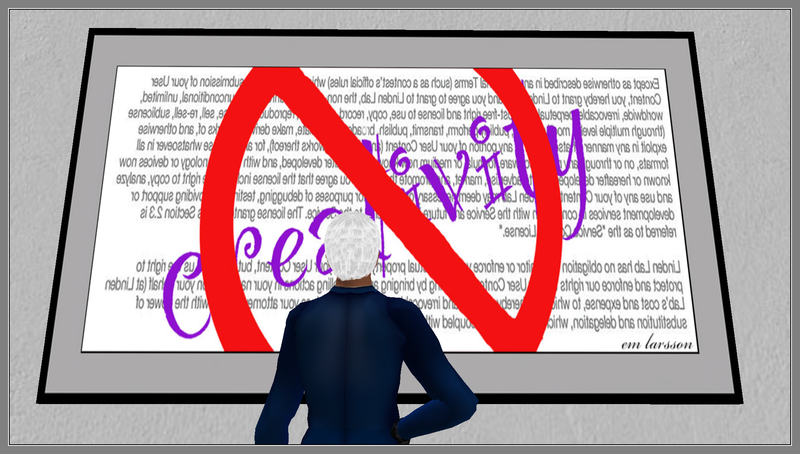 Create a piece of art that expresses your point of view on the Linden Lab terms of service section 2.3. 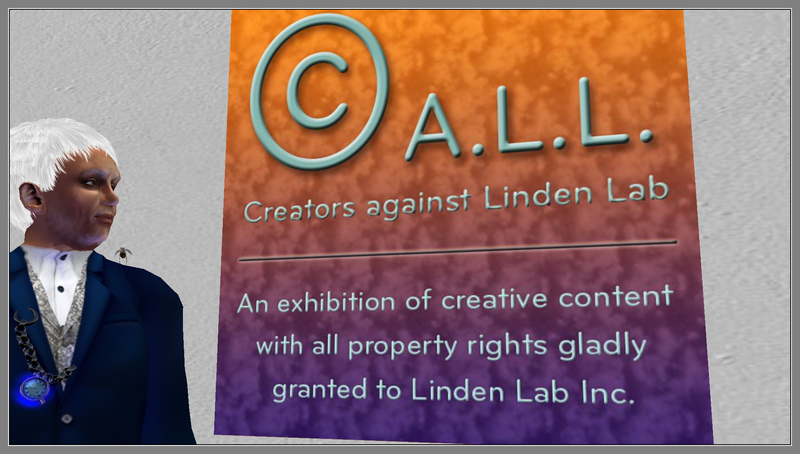 – create a piece of art which property rights you will gladly grant on your own free will to Linden Lab. Somnium Photo Art Gallery will host an exhibition with these pieces of art throughout November and December. There will be a vernisage first week of November – details about date and time will be announced in the groups. Pieces of art should be not more than 2 prims and 4 x 4 meters. 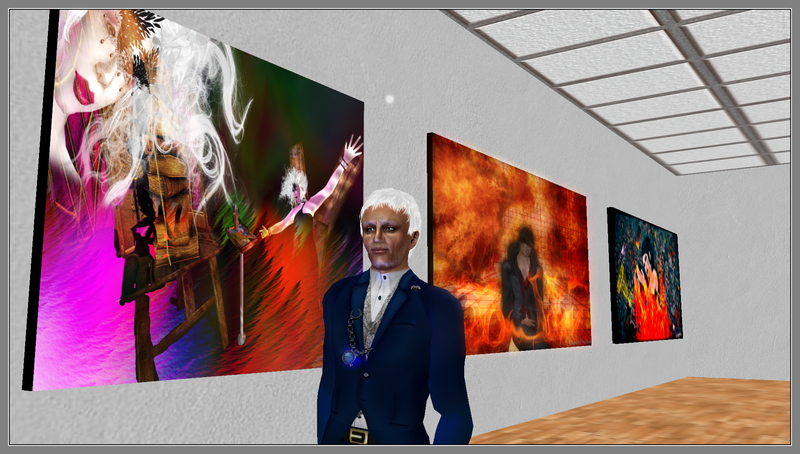 They have to be set for sale at 0 L$, as the content you have uploaded to SL is not yours anyway with the current LL TOS. All pieces should be submitted to Walt Ireton, as a prim or texture (full perm), until October 31st . If there will be more entries as there is available space in the exhibition room, I will select which pieces will be in the exhibition. Remember that Linden Lab “owns Intellectual Property Rights in (…) Linden Lab trademarks, service marks, trade names, logos” – as it is stated in the same document which grants full property rights to LL for all YOUR creative content. 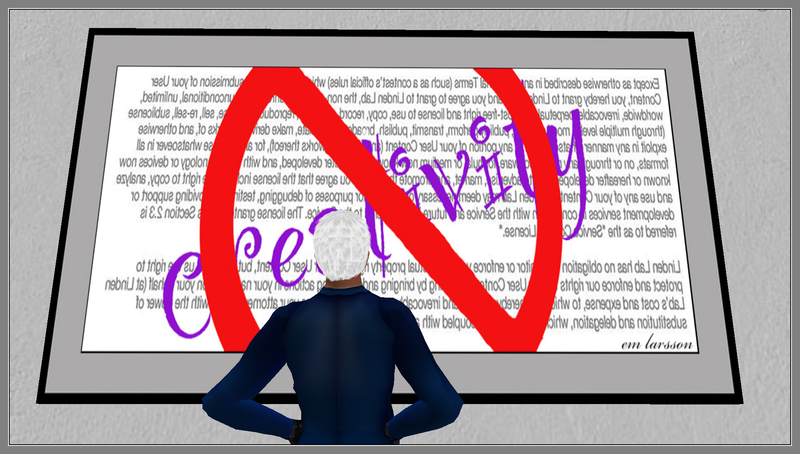 Don’t use anything that violates legal property rights of LL – don’t be insulting or (too) vulgar. The theme of this exhibition is a serious topic, concerning the legal rights of all of us .. but hey, lets keep cool anyway! Contact Walt Ireton if you wish to be a part in this exhibition or if you have any questions. As a contribution to C.A.L.L. 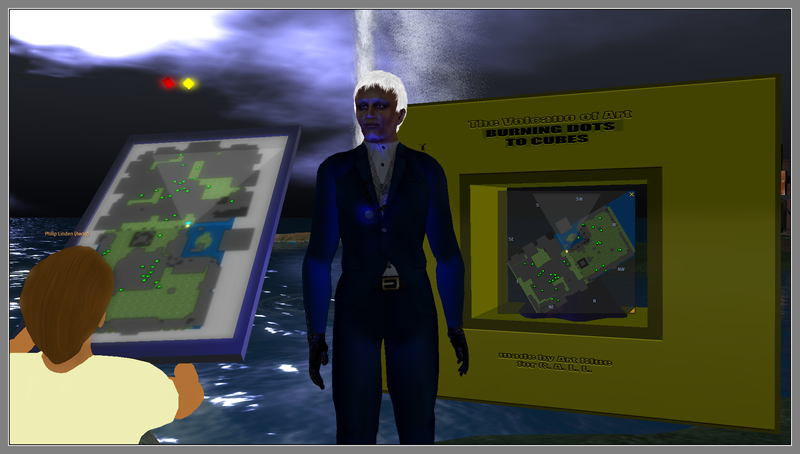 Art Blue created a machine: BURNING DOTS TO CUBES. and the machine will speak to you. You may modify the machine as it is given full perm. A more advanced machine [with 30 prims] you find at the Burning Man SIMs. Here is a selection of works handed over to C.A.L.L. in October 2013. I dont list the names of the creators as they are no longer in a position to claim they are. One of the pictures you have to mirror. Accidentially I forgot to do it. Maybe Linden Lab will do it and becomes this way creative.